From small medieval towns, unbridled woodland, a fire breathing dragon and large festivals, there’s a lot more to Germany than beer, sausages and a great view – it’s rich in history, culture and tradition, too. There are plenty of countries that carry the “must-see” label and Germany is certainly one of them. Germany has over 100 top-notch attractions like the Berlin Wall, Europa-park, Neuschwanstein Castle and more, but during your trip you should put aside a few days to visit the South-East side of Bavaria to live like a local. Take some time to truly indulge in German history, culture and traditions while you visit little towns that feature great food, amazing old architectural buildings and adorable little shops along bricked roads—you won’t regret it! Berlin is one of Europe’s most modern and cosmopolitan capitals, and yet, just two hours away by train, you find yourself in the middle of a medieval town, where nearly every building is 600 years old, there’s no McDonald’s, no advertising and the stones on the main road are older than your great-great-great-grandmother. I’m talking about the Medieval town of Regensburg. 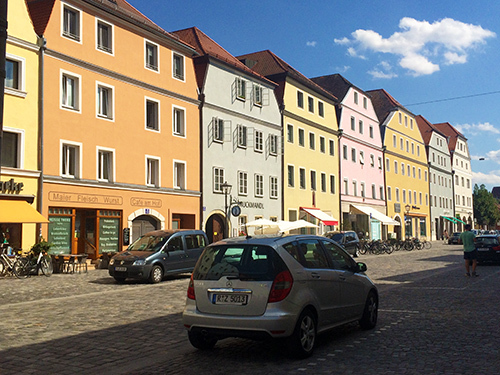 Because Regensburg owns the largest number of medieval buildings listed, this city is rich in history and you can take it all in by putting on a pair of comfortable walking shoes and going to town—literally. 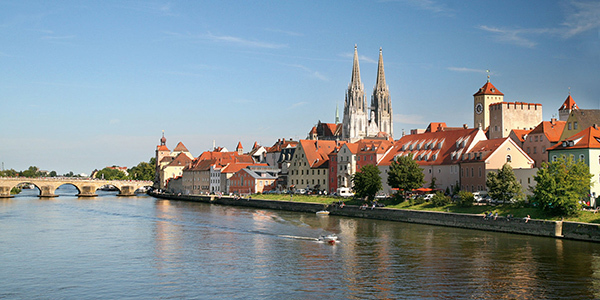 Some destinations on your bucket list could include visiting the Dom which is a huge cathedral that marvelously shows off the work of Gothic architecture in Bavaria, the stone bridge which connects new Regensburg to the older part of the city that wasn’t destroyed during the war, and you could also grab a bite to eat at the Regensburg Sausage Kitchen—you can’t go to Germany and not eat a sausage, it’s almost illegal! Of course, you can’t forget the fun factor so you’ll need to hit up a good ol’ festival with beer, tents, carnival rides and traditional lederhosen. The Gäuboden Festival is a mega-event hosted in the thriving city of Straubing, in the heart of lower Bavaria. 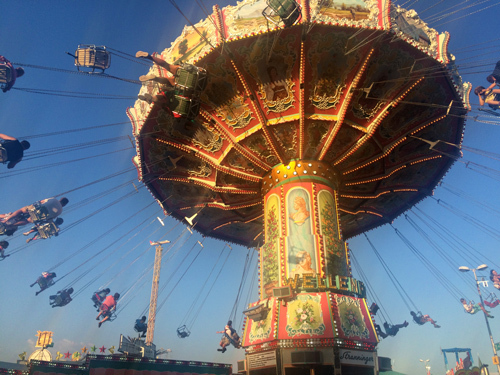 With over 1.4 million visitors annually, which is 31% more than Straubing’s population, this festival will truly give you a traditional German volkfest experience. The event starts off with a city-wide parade where everyone dresses in traditional clothing and the float participants give candy, beer and bread to the audience—what more could you ask for in a parade? There is also a carnival that is open for 10 days that features large food tents, carnival games, and my personal favourite, special beer tents that provide traditional Bavarian folk music and dances accompanied by live brass bands. 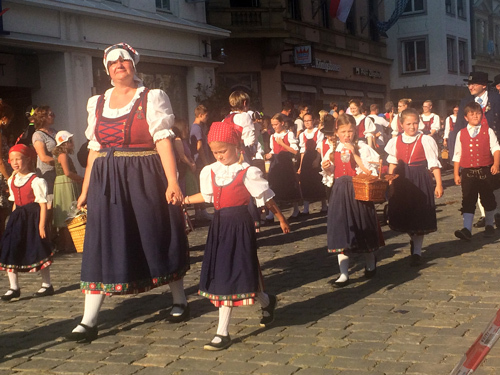 Locals from Straubing walking through the city during the Gäuboden Festival in traditional clothing. With every good carnival there’s great rides. The Gäuboden Festival did not disappoint! 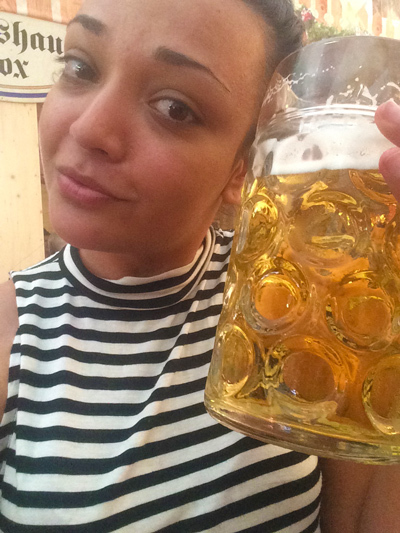 Faze’s Jessica enjoying beer while listening to traditional Bavarian music during the Gäuboden Festival. 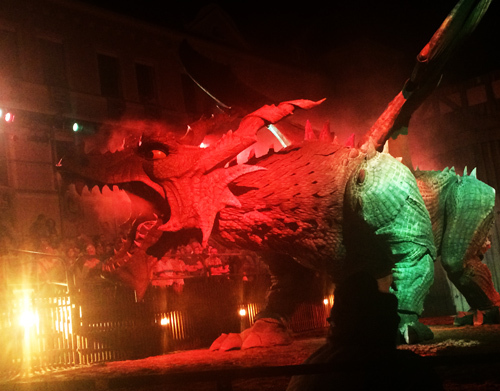 Going to a live play is always exciting—but nothing will compare to the excitement of seeing a dragon slayed in the city of Furth im Wald. Situated halfway between Nuremberg and Prague on the border of the Czech Republic, this little town has over 500 years of history to offer during its annual Drachenstich, the oldest folk play in Germany. 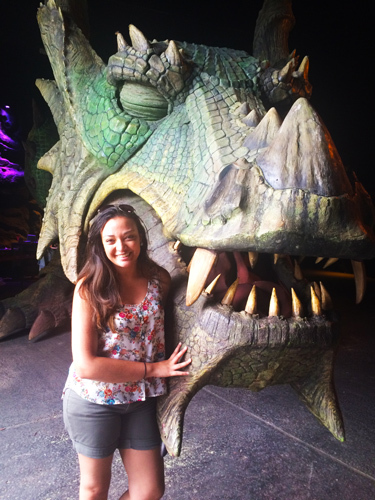 What’s so amazing about this play is the dragon itself. It’s the largest robot in the world, walking on its own legs, and full of electronic special effects (what’s a dragon if he can’t breathe fire, right?). The play depicts the fate of this small town during one of their toughest years, the medieval Hussite War. Can the knight spear the dragon and save the girl, his town and everyone in it? You’ll have to see it to find out. The fierce dragon from the Drachenstich play. woodland, which is unique to Europe. It’s home to over 2.6 million overnight stays from tourists, making it a very important destination in the Bavarian Forest. Take in a deep breath of fresh air while hiking or mountain biking through the most-forested region in Germany. 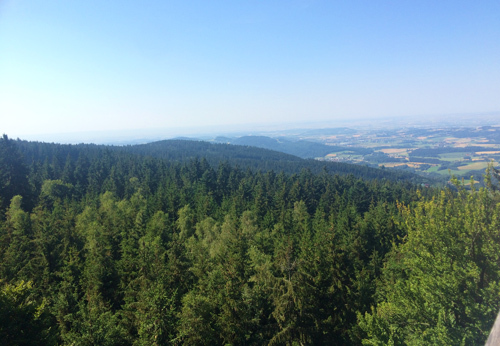 Taking in some fresh air while enjoying the gorgeous view of the Bavarian Forest. variation and rich creativity in baking, from dark rye to richly seeded and wholegrain breads and, of course, pretzels which go hand-in-hand with a German sausage and pint of beer! 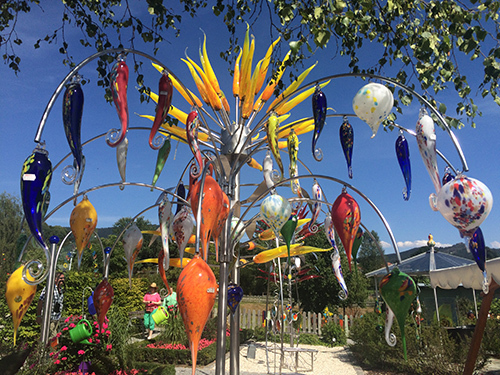 Outside of the iconic Joska Crystal Factory—how pretty! 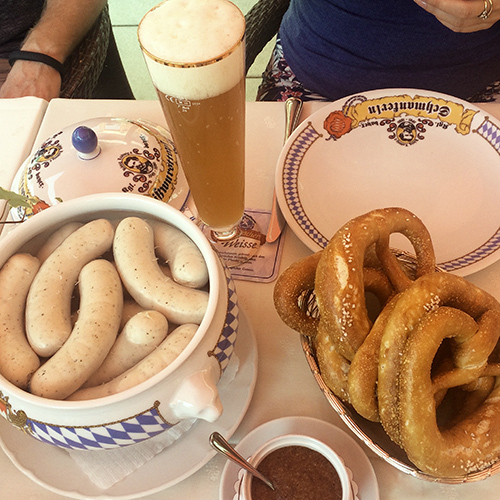 A traditional Bavarian breakfast with white sausages, pretzels, sweet mustard, and of course, beer.